This Vintage November 30, 1981 Time magazine is complete and in very good condition with slight wear and slightly yellowed pages. This magazine measures approx. 8" x 10 3/4" and is suitable for framing. 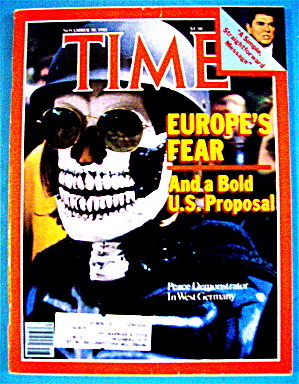 The front cover features "Europe's Fear: And A Bold U. S. Proposal (Peace Demonstrator In West Germany)". Full of news stories of the day and nice vintage ads.